Ten daredevil children from around the country were selected to take part in an action packed stunt day to learn how to be Young Bond – the world’s most famous spy as a teenager. To celebrate the publication of Charlie Higson’s second Young Bond book, Blood Fever, published by Puffin Books, and Player One’s new mobile phone game Young Bond: SilverFin, The Young Bond Stunt Academy took place at Eton College, Windsor, where James Bond, Ian Fleming, and, of course, Young Bond himself went to school. The ten intrepid girls and boys demonstrated their spy potential by competing to be the Young Bond. 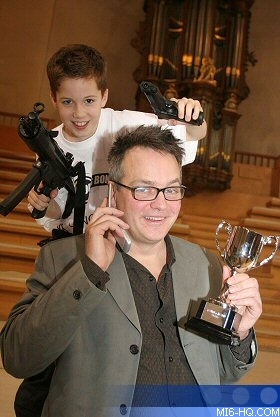 Author Charlie Higson attended the event and the lucky winner will have their name written into his next book – the third in the Young Bond series, and appear as a character in the next Young Bond game. Blood Fever is the second in a planned series of five Young Bond books and is published by Puffin Books under license from Ian Fleming Publications Ltd on the 5th January. 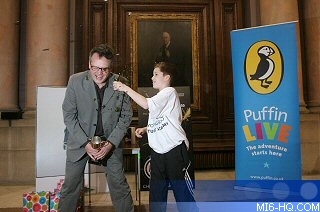 Charlie Higson’s first bestselling Young Bond book SilverFin was published in March 2005. 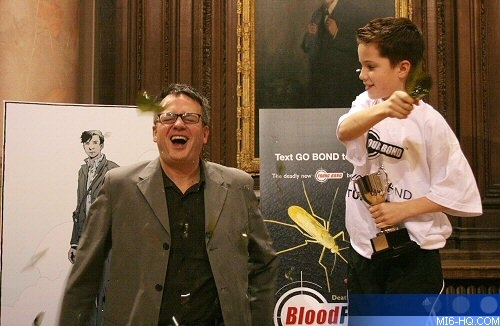 Billy Jones, 11, was crowned "Young Bond 2006" by author Charlie Higson and the stunt professionals at 4:30pm. Click here for an exclusive interview with Charlie Higson about the latest Young Bond novel Blood Fever. • Combat (Learn Martial Arts and how to work with props such as shattering glass bottles). • Explosion leaps (Learn how to fly through the air as if you’ve trodden on a land mine). • Falls (Learn all the different types of stunt falls and using body padding).